In 2017, the best way to beat stock market benchmarks has been to simply buy tech shares. But as that strategy looks increasingly unstable, an intriguing alternative has emerged: large-cap biotech. The fragility of the tech sector was on full display Thursday, as the Nasdaq 100 dropped as much as 1.7%, more than double the biggest intraday loss for the broader S&P 500. In a market largely devoid of price swings, tech has remained a lightning rod for sharp fluctuations. And while the Nasdaq’s 22% year-to-date surge is among the best you’ll find, traders are starting to look elsewhere. 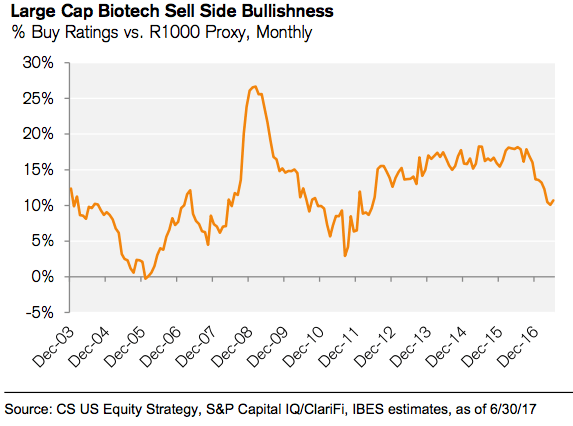 That’s been the experience of Credit Suisse’s chief US equity strategist, Lori Calvasina, who says investors have told her they see biotech as an “interesting alternative” to tech. And while she personally isn’t yet racing to the rooftops to make the case for biotech, she sees a handful of very compelling reasons it’s a good bet. The first stems from one of the most popular arguments against tech – that everyone has been chasing outperformance by piling in, making it one of the market’s most crowded trades. Biotech doesn’t have that problem. In fact, Credit Suisse finds that sentiment on large-cap drug developers is the lowest in roughly five years. In other words: There’s opportunity there. Further, while tech accounts for eight of the 10 most popular overweight positions for large-cap growth funds, biotech has just one representative. 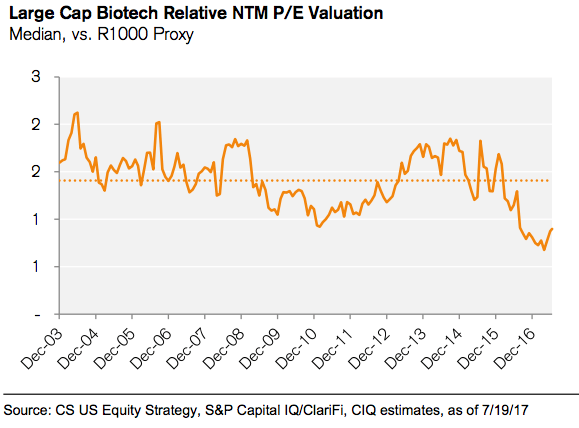 Another argument in favor of large-cap biotech is that it’s inexpensive relative to the broader market. The group’s forward price-earnings ratio is close to the lowest since 2003, relative to the same measure for the Russell 1000, according to Credit Suisse data. Biotech found itself in a unique position heading into the presidential election last year. It plunged 13% in the six weeks before November 8 on speculation that Hillary Clinton, if victorious, would make good on her promises to cut drug prices. While the group surged after Donald Trump’s surprise victory, it’s been chasing the stock market’s grind higher ever since. Calvasina stresses that this is not the case for the broader healthcare sector, which includes hospitals, managed-care providers, and device makers, among others. It’s simply not attractively priced like its biotech subsector. But overall, the healthcare sector has enjoyed inflows into exchange-traded funds. The group has actually been the beneficiary of outflows from tech funds, Credit Suisse finds. 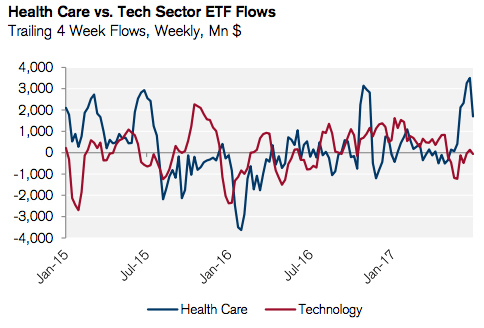 For example, an ETF tracking healthcare companies in the S&P 500 has absorbed a net $848 million in fresh capital since the start of June, while its comparable tech fund saw $419 million of outflows, according to data compiled by Bloomberg. Amid all of these positive drivers, Calvasina is far from blindly confident about large-cap biotech. She recognizes a few potential headwinds for the sector. That most notably includes the manner in which biotech stocks have historically gone in the opposite direction of interest rates. With the Federal Reserve in the middle of hiking rates and making plans to unwind its massive balance sheet, this is a legitimate concern. Additionally, recent earnings momentum has been “lackluster” for large-cap biotech, both compared to the group’s history and versus tech and healthcare, Calvasina says. In the end, there’s no telling whether biotech will live up to the potential it appears to have, especially with these threats looming. But you could certainly do a lot worse if you’re looking to escape a tech sector that appears to be reaching critical mass. Investing is essential for your financial future, but it can beintimidating. All the terms, abbreviations, and numbers are enough to scare any potential investor away. Luckily, software is making the process easier and more accessible than ever. Robo-advisorsprovide financial advice or portfolio management online or via a smartphone application. Rather than using human managers to build portfolios, they usealgorithms to determine where to invest. 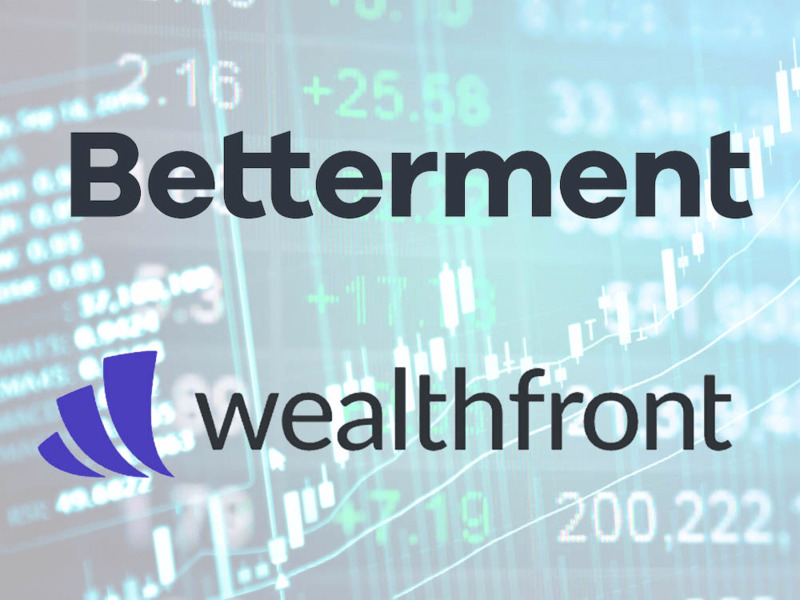 We compared two of the largest and most popular robo-advisors in the US, Betterment and Wealthfront. You can’t go wrong with either service, but you may want to consider the specific features that could make you favor one service over the other. Learn more about Bettermentandsign up for an account here. Learn more aboutWealthfrontandsign up for an account here. 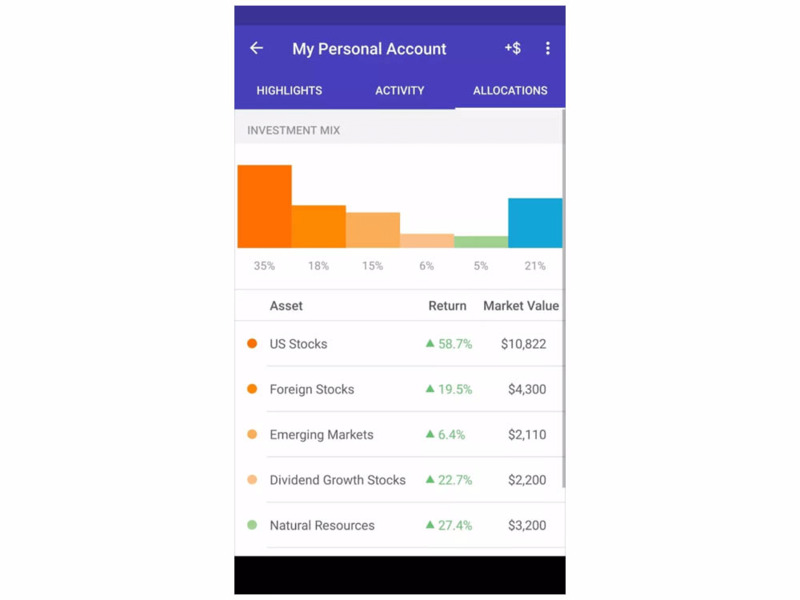 Betterment and Wealthfrontbothcombine proven investment strategies with software so that you can maximize your returns. They are available online and as an iOS or Android app. 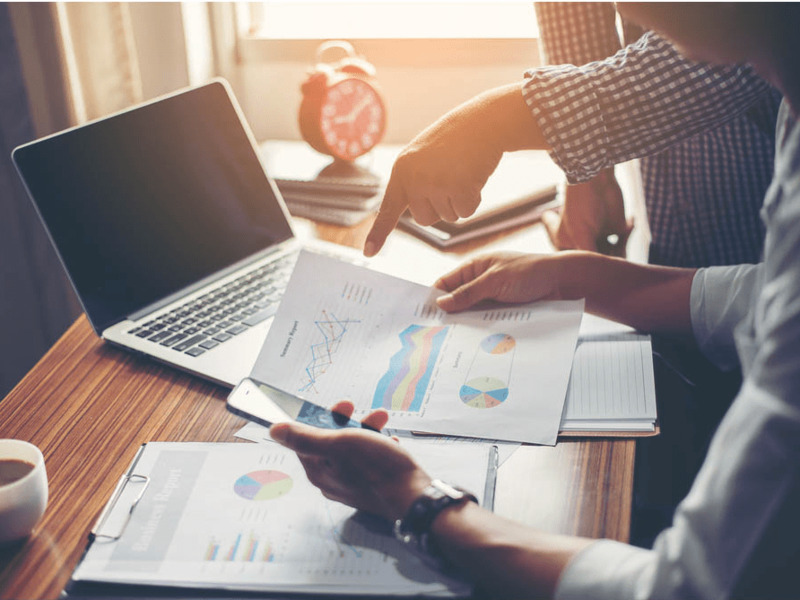 They are similar in many other ways, from the financial solutions they offer to the methodologies used to get you the best results. The differences lie in the details. 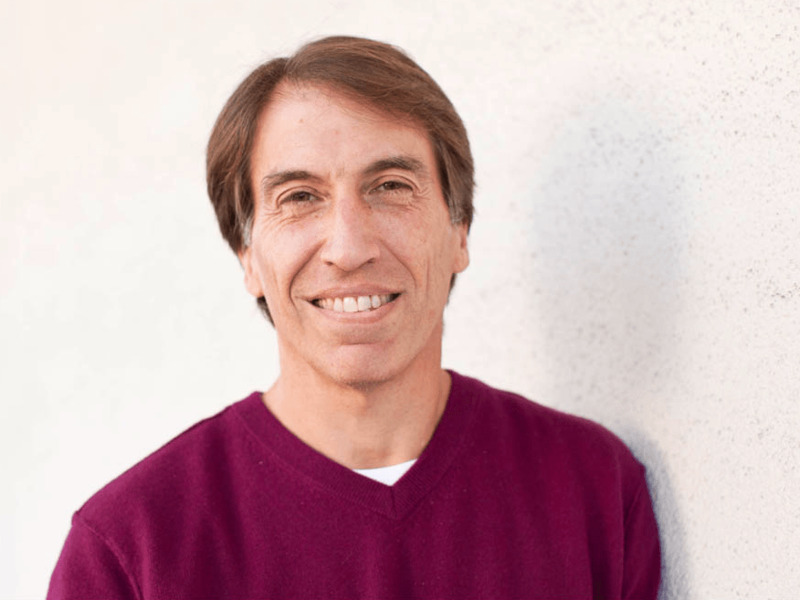 For example, in offering the 529 college savings plan, Wealthfront is the better option for parents who wantto start saving up for their kids’ academic futures. Meanwhile, Betterment has a tiered pricing system and is suitable for investors who would also like to seek advice from real human advisers. Betterment was founded in 2008 by Jon Stein and Eli Broverman. While studying behavioral economics in college, Stein realized he could apply thoseconcepts to the mistakes he was making in managing his own investments. Economics assumes people are rational, when in reality they are far from rational, especially when it comes to managing money. He wanted a service that told him what to do with his money, and then did it. He teamed up with Broverman, a securities attorney at the time who understood the regulatory landscape of the financial world. Wealthfront was also foundedin 2008 byAndy Rachleff and Dan Carroll. Rachleff taught tech entrepreneurship courses at the Stanford Graduate School of Business. Entrepreneurs and students always asked him for investing advice, but he couldn’t recommend the services he used because the account minimums were too high. As Vice Chairman at the University of Pennsylvania’s endowment investment committee, he noticed that the best-managed endowments in the world relied on outdated tools, and he had a vision for an upgrade. Carroll was a former trader helping his parents assessing the damage they experienced from the financial crisis in 2008. He looked at the statements from their financial adviser and didn’t think they were being given quality advice. LinkedIn cofounder Reid Hoffman spoke this past May at the Tech Alliance luncheon in Seattle, and something he said got me thinking about Silicon Valley and all innovation hubs – in a different way. While interviewed on stage by angel investor Sarah Imbach, he called Silicon Valley myopic and urged people to pay attention to what’s going on in Seattle, the other tech hub where he now spends time as a startup investor and Microsoft board member. Myopic is exactly right. And with that Silicon Valley and other innovation hubs risk losing their edge. The innovation ecosystem in the Bay Area comes together like a non-linear neural network. There’s the perception that it is all self-organizing and efficient. They have ideas, networks, partners, teams, capital, and customers – it’s all there, and innovation can quickly scale. But, at times, a myopic view can result in a follow-the-leader mentality. A case in point: In some instances venture capitalists give the appearance of a herd mentality by investing in trends they all see, at the same time. In a place like Silicon Valley, resources do come together quickly. And what’s dangerous is pushing the same idea forward by a multitude of investors and entrepreneurs. Oftentimes, everyone wants to jump in for fear of being left out. This is human nature. This attitude can result in VCs and entrepreneurs not taking risks and instead pursuing what the VC or entrepreneur next door is doing. The VC’s goal is to aggressively participate in the financing feeding frenzy at the right time so they can get a return. The entrepreneur might look for a fast and easy exit. This is where bubbles come from. But a return or an exit is not innovation. The problem is this: You cannot innovate with a consensus mindset. Of course, there are still new and original ideas that completely transform a market. Examples include ride sharing and Netflix, but these are rare. Mostly what we are seeing is that networks too often come together to do incremental things. They are not creating the next transistor chip or laser or next energy source. Certainly not with the frequency you would expect or we desire. Innovation is more than just cool new apps. An incremental mindset does not create breakthrough ideas. It creates, simply, temporary market penetration. The Silicon Valley ecosystem itself and Seattle too – can at times act like a big risk-averse company with a big balance sheet it’s trying to protect. It’s Clayton Christianson’s Innovator’s Dilemma, applied to the whole network instead of a company. Here’s the Innovator’s Dilemma: Once a company has successfully developed and launched an innovative product, it wants to produce it in a more efficient and profitable way rather than invest money in new, innovative, disruptive ideas. The dilemma is between investing in something new that could cannibalize the business now and letting upstart rivals run with the lower-end disruptive innovation that could blindside you later. Some companies are working to break free of this dynamic that chooses scale over innovation. Google is leveraging its success via Alphabet. Internet search is becoming progressively less profitable, so they are focused on innovative new areas like life sciences, robotics, and home automation. Amazon is succeeding around retail and looking at it from different angles; case in point: its recent purchase of Whole Foods. Amazon is leveraging its expertise around operational efficiency to innovate in very different ways from the moonshot approach. It’s time to change the myopic approach to innovation ecosystems. If we don’t make adjustments now, we’ll be talking about how the Innovators Dilemma is no longer an issue just for companies. It wil instead be an issue impacting innovation regions and entrepreneurial hubs like Silicon Valley and Seattle. The time is now to disrupt the actual innovation process. Vikram Jandhyala is Vice President for Innovation Strategy at the University of Washington, Executive Director of CoMotion, and co-Executive Director of the Global Innovation Exchange (GIX). He is a professor and former chair in the Department of Electrical Engineering and serves on the advisory boards of The Technology Alliance, Washington State China Relations Council, UW Foster Business School’s Buerk Center for Entrepreneurship, and Partners for Our Children. He founded, along with his students, Nimbic (acquired by Mentor Graphics) and was an early employee at Ansoft (acquired by Ansys). Former Trump campaign chief Paul Manafortis at the center of the controversy regardingpossible collusion between Russia and the campaign. Here’s what you need to know. 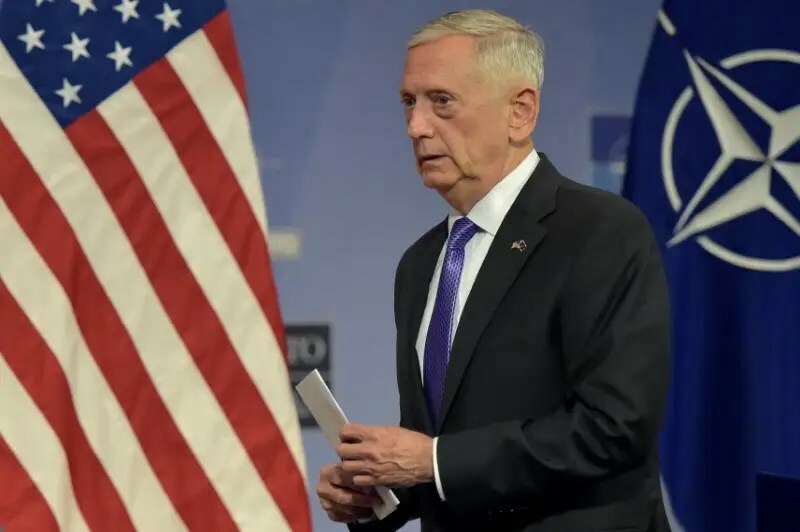 Defense Secretary James Mattis and other military leaders are looking for ways to reduce the training and administrative duties that many in the armed services view as a burden. 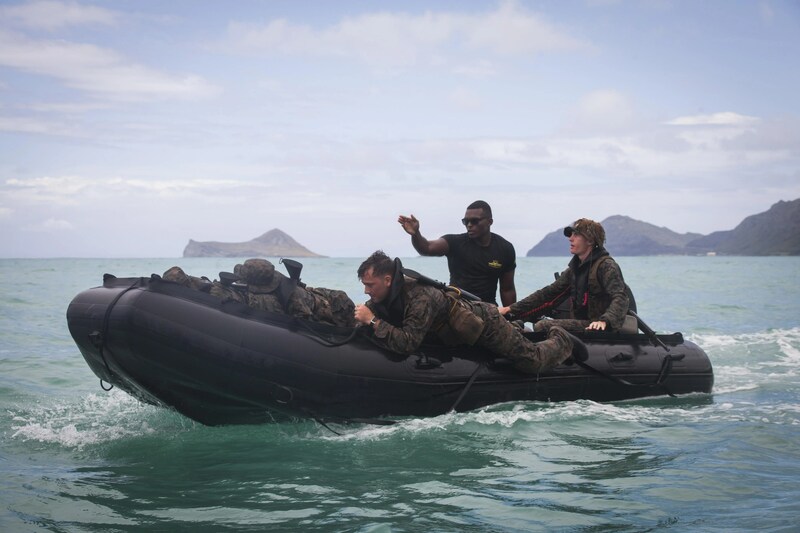 The latest part of this effort is a review ordered by Mattis to identify and either reduce or eliminate the duties that pull military personnel away from tasks directly related to their jobs as soldiers, sailors, airmen, and Marines. The directive appears to be part of a campaign to address what a 2015 Army War College report called the “deluge of requirements” facing commanders. That report, according to Army Capt. Scott Metz, a trainer at the Army Joint Multinational Readiness Center in Germany at the time of writing, “makes the case that the Army overtasks subordinates to such a level that it is impossible for Army units and Army leaders to do everything they are tasked to do. The authors of the Army College study also “state that since non-compliance is not a viable option, leaders must choose which tasks to conduct to standard and which tasks to just ‘report’ that they were done to standard,” Metz wrote. 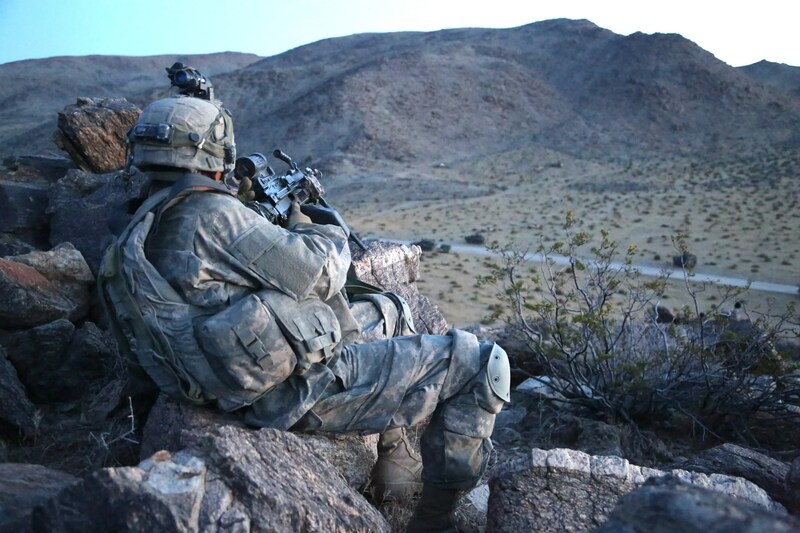 Though readiness may mean different things to commanders at different levels, Metz argued that tasking unit commanders with so many duties has detracted from combat training and left US military personnel at a disadvantage on the battlefield. This state of affairs doesn’t appear to be limited to the Army. Air Force officials have cited “cultural issues” – such as training requirements and trouble maintaining a work-life balance – as reasons for the service’s recruitment and retention problems. The Air Force has decided to waive some training responsibilities for airmen and to relax other recruiting policiesto attract more recruits. Such problems are not limited to the Air Force, and some have called for the reinstatement of the draft to address the personnel, financial, and economic issues created by an all-volunteer force. Maj. Gen. Brian Kelly, the commander of the Air Force Personnel Center, has acknowledged the need to be more adaptive in assigning duties and has made that one of the goals of his tenure. 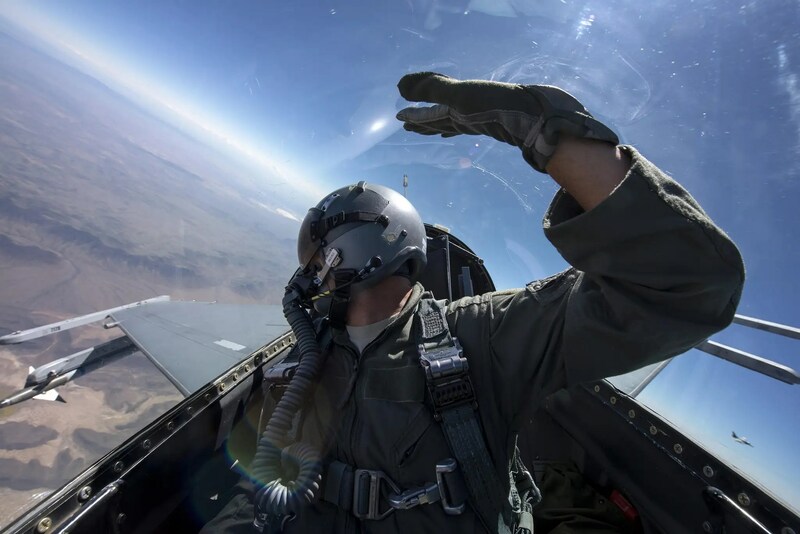 The Air Force – as well as specialized units like the special forces – have been especially burdened by ongoing military efforts over the last 20 years. Special operationsunits have seen rampant drug use, and diagnoses of post-traumatic stress disorder have nearly tripled among veterans over the last decade. Those continuing operations, coupled with budget cuts, have left many units in each service branch behind in their training and readiness requirements and lacking in operational capacity. “After more than a decade combatting violent extremists and conducting contingency operations in Afghanistan, Iraq, and most recently Syria, [the Defense Department] has prioritized the rebalancing of its forces in recent budget requests to build and sustain the capabilities necessary to prevail across a full range of potential contingencies,” states a Government Accountability Office report released in June. “However, DoD has acknowledged that unrelenting demands from geographic commanders for particular types of forces are disrupting manning, training, and equipping cycles,” it adds. 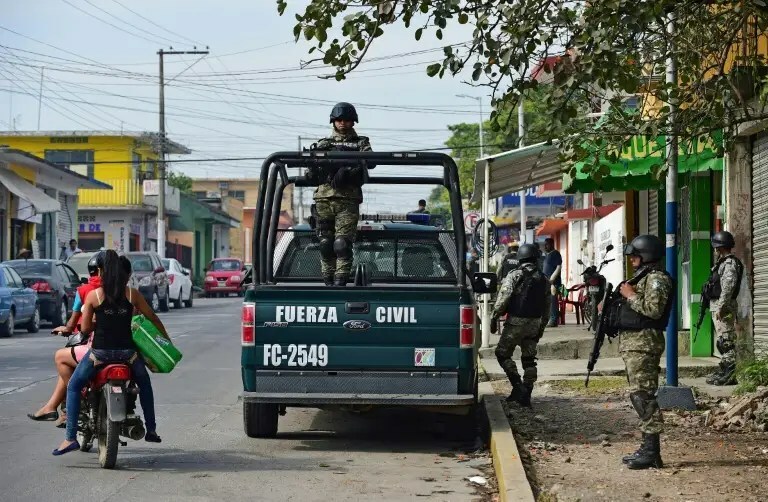 Coatzacoalcos (Mexico) (AFP) – Scores of Central Americans being smuggled to the United States were rescued Saturday from an abandoned truck in Mexico, a near-tragedy with chilling similarities to a deadly incident last week in which 10 would-be migrants to the US perished. 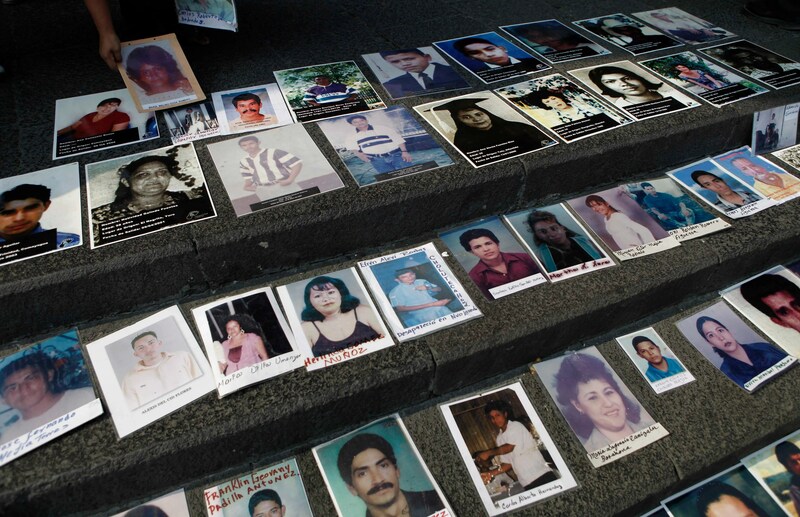 Authorities said a total of 178 people were found in the tractor-trailer truck in the town of Tantima in Mexico’s Veracruz state. Officials said occupants of the truck on Saturday narrowly averted tragedy, realizing at some point that they had been abandoned by the traffickers. A few managed to escape the vehicle and enlist the aid of local residents who gave them food and water. The Central Americans were then transported by police to a migration center, where they were given medical assistance before authorities began the process of returning them to their countries of origin. A Mexican military source told AFP that most of the migrants were adults, although there were also a handful of minors found in the truck. 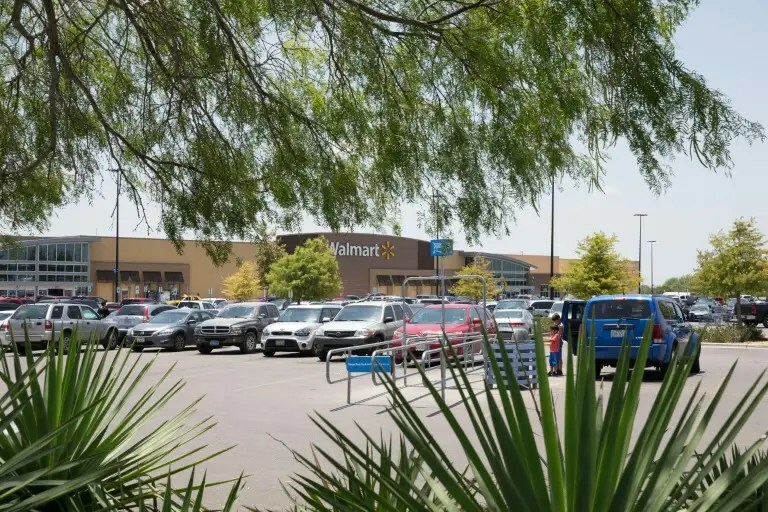 Their rescue comes less than a week after the horrific suffocation deaths of 10 migrants who were trapped in an 18 wheel truck and discovered last Sunday in a Walmart parking lot in San Antonio, Texas. Authorities said as many as 200 migrants may have been crammed into the trailer found in Texas, many of whom had to be hospitalized. Some survivors fled the parking lot in waiting cars, according to witness accounts. “These smugglers have no regard for human life and seek only profits,” said Kelly, a retired military general who has been to Mexico twice to discuss immigration, human trafficking and the sprawling cross-border drug trade. Officials in the United States say fewer migrants are making the perilous overland journey to America from Central American and Mexico in recent months, in large part because of harsh, anti-immigrant rhetoric from US President Donald Trump, who came to power in January. Migrants from Central America and Mexico willing to make the dangerous trip risk being victimized by thieves, criminal gangs and unscrupulous traffickers who sometimes take their money and abandon them in desperate conditions on either side of the US border. Veracruz and the surrounding area has become one of the most dangerous regions for undocumented migrants making their way to the United States, according to rights groups, in part because of drug cartels like the notorious Zetas, which often charges a fee before allowing travelers safe passage.